Vietnam, China and Thailand all have satisfied the US Department of Agriculture’s (USDA) first test for continuing to send pangasius to the United States, but two more tests remain. Just those three of the 14 countries that initially expressed interest in continuing to export siluriformes – the genus of fish that includes pangasius and domestic catfish – to the US will be able to do so. They have successfully filled out their self reporting tools (SRTs) in a way that indicates their approach to guaranteeing the safety of their fish is equivalent to the standards maintained by the US, USDA’s Food Safety and Inspection Service (FSIS) announced Thursday. Processors in all three countries now can look forward to on-site audits by FSIS inspectors “within the next three months, and probably sooner than that", Carmen Rottenberg, the USDA deputy under secretary for food safety, told Undercurrent News. Later, the countries’ products will also face point of entry inspections. “If you look at this from a consumer perspective, we have worked extensively with foreign countries to determine the equivalence of these catfish producers and the countries that export products here and we are just committed to ensuring the safety and wholesomeness of all products imported into the United States,” Rottenberg said. Guyana, Nigeria, Pakistan, Myanmar, Bangladesh, El Salvador, the Dominican Republic, Canada, Mexico and the Gambia all stumbled and knocked over USDA’s first hurdle. Their pangasius products will no longer be allowed into the country, though they are welcome to go through the application process again, the USDA officials said. There were a long list of reasons why countries failed USDA's first test, from simply not providing the required details to indicating a lack of compliance with Hazard Analysis Critical Control Points standards or a sufficient number of inspections, Rottenberg said. All of the countries were given 90 days to respond to perceived deficiencies in their SRTs. Brazil simply failed to submit its responses by Sept. 1 and was dropped from the process, the agency said. But the country that matters the most is Vietnam. It’s the US’ largest source of pangasius by far. 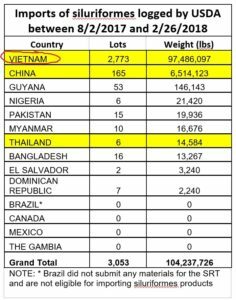 Between Aug. 2, 2017, when FSIS required pangasius importers to begin using import houses where it could more carefully inspect the shipments, and Feb. 26, 2018, the Southeast Asian nation sent the US 97.5 million pounds (44,225 metric tons) of the fish. By comparison, China was a distant second during the seven-month period, accounting for 6.5m lbs. Thailand ranked seventh among siluriformes sources during the period, responsible for just 14,584 lbs. It seems unlikely that Vietnam passing the first of USDA’s three tests will have any impact on the complaint it recently filed with a dispute settlement body at the World Trade Organization (WTO), claiming the US government’s handling of pangasius is an unfair trade practice. 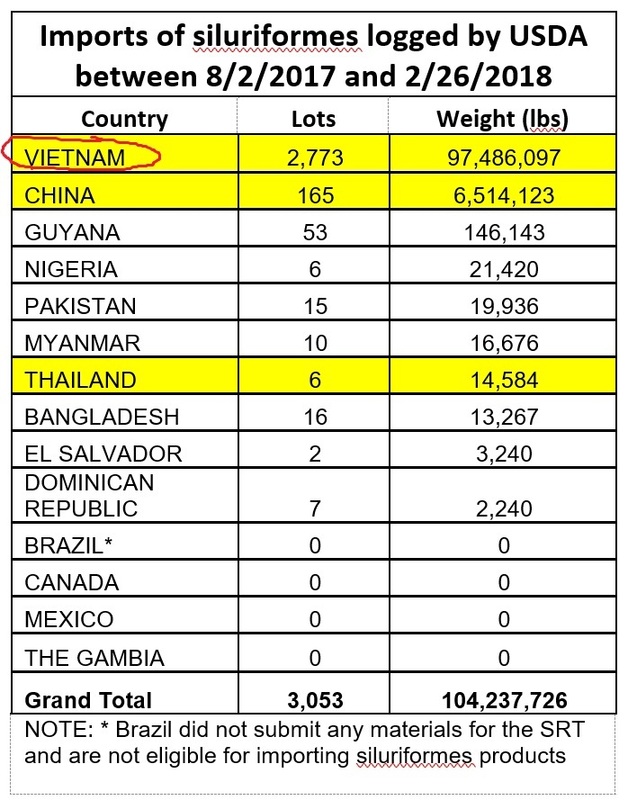 Vietnam has also complained to the WTO about the US' use of anti-dumping duties on pangasius. Following a long battle over the matter in Washington, D.C., FSIS took over the job of guaranteeing the safety of siluriformes in September 2017, a job previously maintained by the US Food and Drug Administration (FDA). FSIS is seen as requiring more difficult standards of processors, an issue that one large Vietnamese-based importer of pangasius told Undercurrent in January could lead to more of the fish being shipped to China. The National Fisheries Institute, the US seafood industry's trade association, continues to advocate for returning all siluriformes back to FDA and this week announced a website dedicated to making the case. But FSIS also is responsible for maintaining the safety of catfish produced by some 105 active establishments in the US that the agency has identified, and they’ve been required to satisfy FSIS standards since March 1, 2016, Rottenberg noted. “With both groups, we’re very cognizant of it looking like we might be treating one differently. We have tried to be as balanced as we can with everybody,” said Philip Bronstein, USDA’s executive associate for regulatory operations. FSIS has employed roughly 77 full time equivalents to catfish inspections in the US, he estimated.